Okay so maybe 4 of the last 16 recipes I posted have been buffalo-flavored-something. And maybe I eat Buffalo Chicken Salad like every other week for lunch. If you are what you eat, then I guess maybe I’m 25% buffalo. Throw this ground turkey on some crinkle fries along with salad fixin’s, and you have one killer lunch, dinner, game day snack, whatever, that tastes DELICIOUS and is real foooooood. 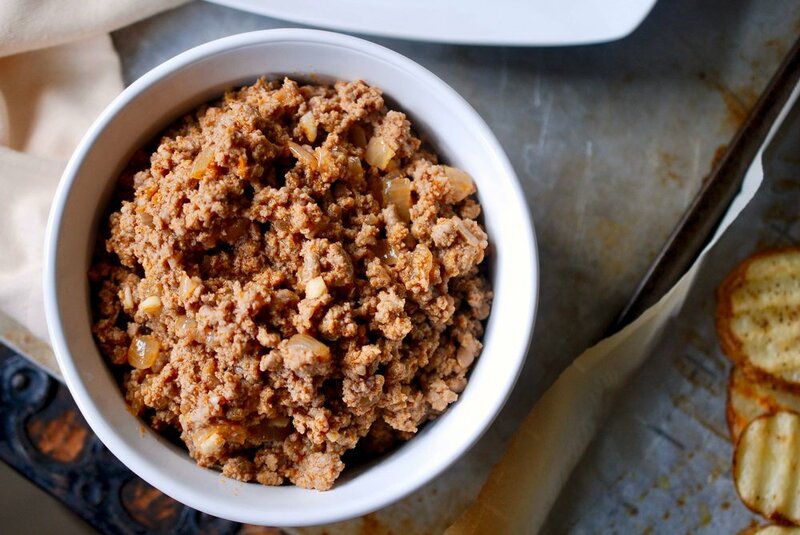 It’s so easy to make, with only 5 ingredients in the ground turkey + whatever toppings you want! I recommend prepping your turkey meat, oven fries, and toppings in advance, then storing them separately so you can eat it for a couple of meals during the week! This recipe makes a lot of buffalo ground turkey, so you can freeze half for later if you want. 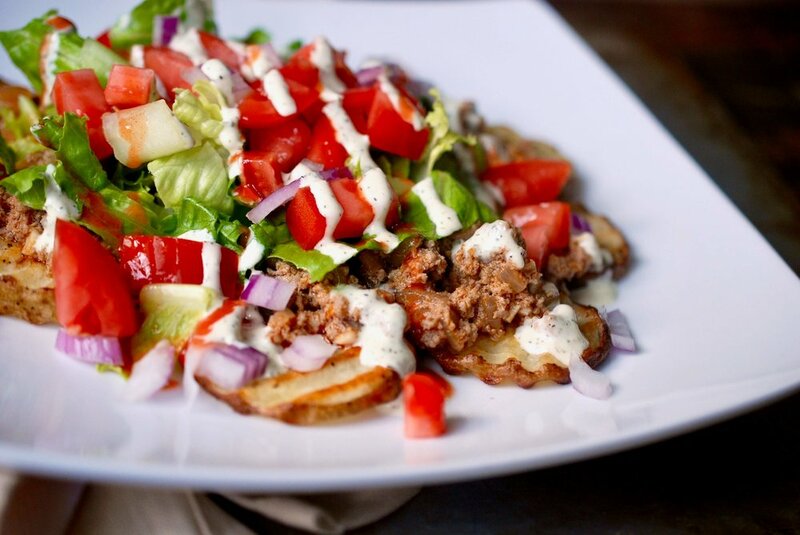 Buffalo Ground Turkey is amazing on oven fries, but it would also be great on a baked potato, on a salad, in tacos, or on zoodles or spaghetti squash! Because I love you, I’m going to post a slideshow of ALL of my buffalo-flavored-something recipes here. It’s definitely my most loved flavor combo of all time, and the best represented here on Maria Makes! I think I should pursue a sponsorship with Frank’s Red Hot! `Preheat oven to 450 degrees and prep potatoes by scrubbing them and cutting into crinkle cuts (or regular fries). TIP: If you have time, soak them in water for 10-15 minutes then dry very well before baking - getting some of the starch out can help to produce a crispy fry! Add to a large bowl and toss lightly with olive oil and arrange on parchment lined cookie sheets to bake. TIP: Though it’s a little tedious, arrange in a single layer, not overlapping, so they can be surrounded by hot air in the oven. If they are all stacked on each other they will steam and not get crispy! Bake for 30 minutes, then flip each fry over and bake for another 10-20 or until they reach desired crisp factor. Season with salt then set aside until you are ready to top them. Next up, make the buffalo ground turkey. Heat a large skillet or pan over medium high heat. Add 2 tsp cooking oil of your choice and saute the minced garlic and chopped onion for about 5 minutes. Add in the ground turkey and cook, breaking it up and stirring as you go, until it’s almost opaque and you don’t see much pink left. TIP: I LOVE this Pampered Chef Mix ‘n Chop thing, but there are lots of other similar tools on the market! At this point, drain off as much of the liquid and fat as you can. Add in 1/2 cup of Frank’s Red Hot and 1/4 cup ranch dressing. Stir to combine and reduce heat to low. Simmer for another 5-10 minutes to let the sauce soak in and reduce. If you feel like it needs more sauce, add in additional Red Hot and ranch. Arrange a layer of the oven fries on a plate, then top with buffalo turkey meat, lettuce, tomato, red onion, and drizzle with Red Hot and ranch for good measure. Portion extra ground turkey into freezer safe containers, press a layer of plastic wrap into the top, seal it and freeze for later!